The ability to read is vital for success. It helps your child succeed in school, helps them build self-confidence, and helps to motivate your child. Being able to read will help your child learn more about the world, understand directions on signs and posters, allow them to find reading as an entertainment, and help them gather information. Before a child can learn to read, he or she must first learn to speak. Talk to your child about everything and anything - whatever interests them. Tell them stories, ask your child lots of questions, play rhyme games, and sing songs with them. 2. Teaching literacy isn’t different than teaching other skills. You don’t need a Ph.D. to raise a happy, healthy, smart child. Parents have been doing it for thousands of years. Mothers and fathers successfully teach their kids to eat with a spoon, use a potty, keep their fingers out of their noses, and say “please.” These things can be taught pleasantly, or they can be made into a painful chore. Being unpleasant (e.g. yelling, punishing, pressuring) doesn’t work, and it can be frustrating for everyone. This notion applies to teaching literacy, too. If you show your 18-month-old a book and she shows no interest, then put it away and come back to it later. If your child tries to write her name and ends up with a backwards “D,” no problem. No pressure. No hassle. 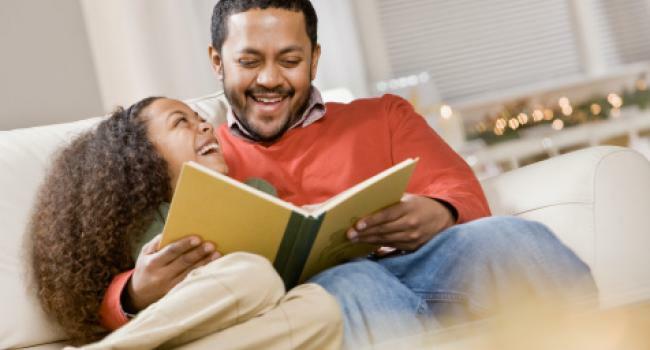 Typically, parents will take the time to read for their children; however, many parents do not put much emphasis or thought on whether their children understands what they've just been read to. Instead, occasionally, make an effort to question your child on what you've just read. Make reading a part of your daily life, and kids will learn to love it. When I was nine years old, my mom made me stay in for a half-hour after lunch to read. She took me to the library to get books to kick off this new part of my life. It made me a lifelong reader. Set aside some time when everyone turns off the TV and the web and does nothing but read. Make it fun, too. When my children finished reading a book that had been made into a film, we’d make popcorn and watch the movie together. The point is to make reading a regular enjoyable part of your family routine. When your child reads, get her to retell the story or information. If it’s a story, ask who it was about and what happened. If it’s an informational text, have your child explain what it was about and how it worked, or what its parts were. Reading involves not just sounding out words, but thinking about and remembering ideas and events.